Sometime several years ago while outside painting, I spent the time focusing on painting the sky instead of the landscape in front of me. This experience stuck with me. 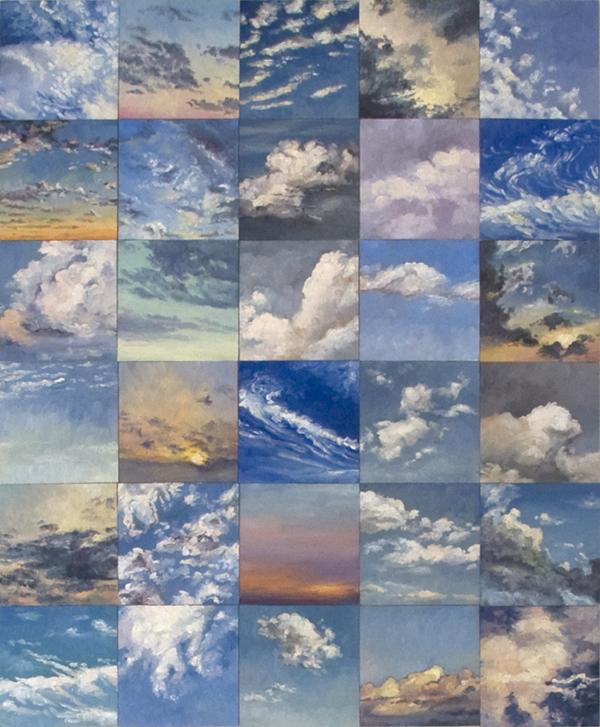 Last year, I took some of the cloud studies and grouped them and framed them as a mosaic, and I just loved the effect. In fact this framed grouping has been gracing our bedroom since then, as I find it to be so soothing. …and now I have 30 of these cloudscapes gracing our bedroom. The paintings were hung in a grouping of 30 directly to the wall with archival acid-free tape. Some of these skies were from various weekend getaways S. and I have taken over the years or from trips to Texas when visiting my grandmother. This series is very personal and each painting is a love letter to myself and to my husband… something from me, of our time together and where we have been. After moving into our new home in December 2016 and not finding a special home for these paintings, I have decided to offer a portion of the series available for sale. Please see my Special Sale Page for more information.